In the first lecture we discuss the mathematical foundation of machine learning and time series. We introduce the notion of function fitting (interpolation and extrapolation), architecture of networks (feedforward, convolutional and recurrent), and explain the nonlinear least square method. We continue with an introduction to time series. In the second lecture we discuss a recent dynamical systems approach to change point detection in time series. We introduce the notion of attractor and measure, and explain the theory of attractor reconstruction from time series. We continue with an introduction to multidimensional scaling and explain how our new approach can be used to reveal functional relationships between the time series and change point detection (both from synthetic and real data). Several examples are given to illustrate our results. Sjoerd Verduyn Lunel studied Mathematics with Physics at the University of Amsterdam and received a PhD from Leiden University in 1988. He is currently Professor of Applied Analysis at Utrecht University. He held positions at Brown University, Georgia Instiute of Technology, University of Amsterdam, Vrije Universiteit Amsterdam, and Leiden University. He was elected member of the Royal Holland Society of Sciences and Humanities in 2012 and is an honary member of the Indonesian Mathematical Society. He was the Director of both the Mathematical Institute and the Leiden Institute of Advanced Computer Science at Leiden University from 2004 to 2007, and the Dean of the Faculty of Science at Leiden University from 2007 to 2012. Since 2015 he is the Secretary of the European Mathematical Society and one of the Directors of the Teylers Foundation. He is currently the Chair of the Board of the National Platform for Dutch Mathematics (PWN). The research of Sjoerd Verduyn Lunel is at the interface of Analysis and Dynamical Systems with applications to Data and Life Sciences. 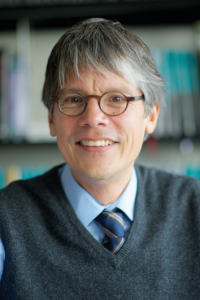 Sjoerd Verduyn Lunel is full Professor in Mathematical Modelling at the Mathematical Institute of Utrecht University. You can read more about him on his website.